Take an innovative Indie singer/songwriter with a crystal-clear voice and pair her with a legendary country producer and the result should be a great musical collaboration. That was the theory which led Dawn Landes to approach the legendary 87-year-old Fred Foster whose production history includes working with the greats such as Roy Orbison, Willie Nelson and Kris Kristofferson (with whom he co-wrote ‘Me and Bobby McGee’), to produce her latest album ‘Meet Me At The River’. Foster has been pretty much retired for many years and Landes had to work hard to convince him to take on production duties, a challenge exacerbated by the fact that he even admitted to having never heard of her before she picked up the phone and called him! Undeterred, she spent many hours at Foster’s Tennessee home and eventually persuaded the great man to make the return to the studio. With Foster now in charge and the session musician list reading like a who’s who of country music, including 13-time Academy of Country Music drummer of the year Eddie Bayers, fellow Country Music Hall of Famer Charlie McCoy on harmonica as well as ‘From Elvis In Memphis’ pianist Bobby Wood, things looked all set for greatness. Foster even recruited 83-year-old country legend Bobby Bare to duet with Landes on the closing track of the album. As you might expect with that impressive cast of characters behind it, ‘Meet Me At The River’ has taken Landes’ more traditional indie based sound well into pure country territory, but disappointingly the resultant output is something of a mixed bag. Landes, as always, sings delightfully, the musicianship from the session line-up is high quality, but when you put it all together it just seems lacking in conviction and almost forced at times. Take ‘Keep on Moving’ as an example. The lyrics wouldn’t be out of place in a late 1960’s protest song but the juxtaposition with the Nashville country style arrangement just doesn’t seem to gel properly and this is a consistent problem throughout the album. Even more egregious is the duet with Bobby Bare on ‘I Don’t Dance.’ It appears to be meant to be as a whimsical ending to the album but it comes across as just plain frivolous and out of place, especially following on from covers of the rootsy Jimmy Driftwood songs, ‘My Chuch‘ and ‘What is the Color of the Soul of Man‘. Landes has a history of doing things her way and she can’t be accused of not being willing to try new musical avenues, even being brave and creative enough in 2012 to release an 8 track EP, ‘Mal Habillée‘, sung entirely in French. 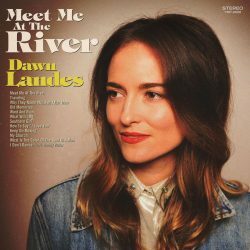 On this occasion though with ‘Meet Me At The River‘, she has delivered an album that is pleasant but mostly lightweight and quite uneven. Ultimately that may well be down to Fred Foster’s production style which appears stuck in the 1970s.